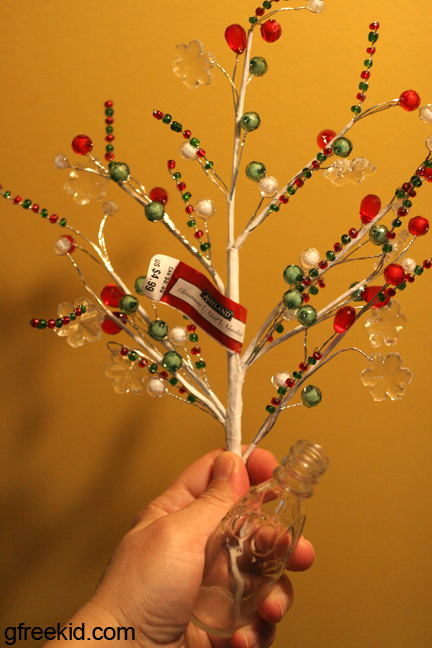 Last I just glued some ribbon around the bottle for some extra color. Any kind of spray, bud vase and ribbon will work. 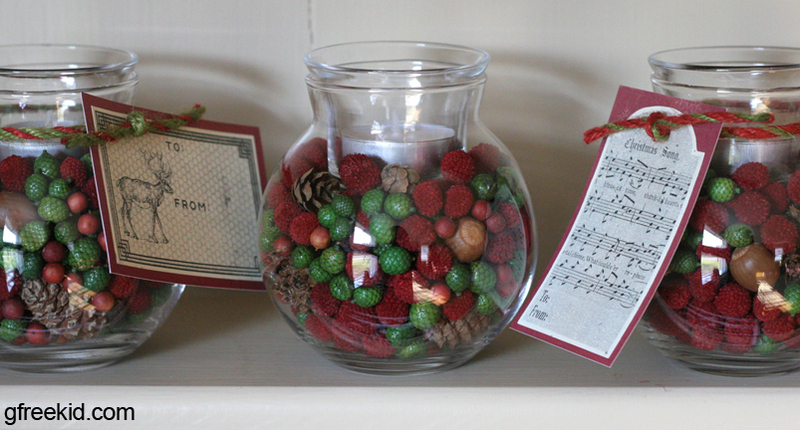 Again, I was at Michaels and saw these red & green, dried, natural decorations on sale. I threw a few bags into my basket (on sale for $2.99 a bag) even though I wasn’t sure what to do with them yet. They looked like tiny seedpods, smooth pinecones and puffballs, but they were dyed Christmas colors. I ended up in the candleholder aisle and this idea just sort of came to me: a clear vase to hold the dried stuff, and a votive holder that fit into the top, sealing away the dried stuff down below so it wouldn’t be flammable. Then I just fit the votive holder on top of it (you could also glue it if you want it to be permanent, but maybe someone will want to change the filling someday) and tied the twine around the neck of the vase. 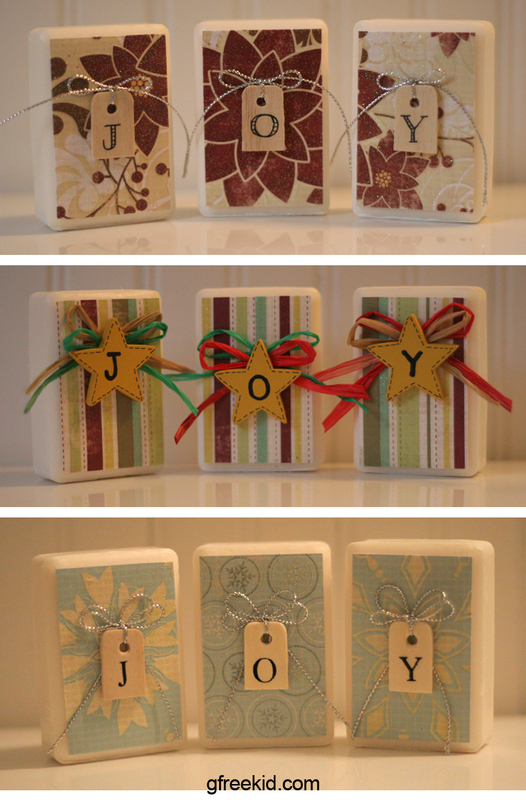 Then I found these great, vintage-style, free gift tags that I printed in b&w from Call Me Victorian and CoreyMarie.com. This project was a piece of cake and I whipped off all 10 in an hour. I went back the next day to buy more supplies so I could make some for myself, as they are just my style. Can’t find the red & green stuff or you’re not too into nature? 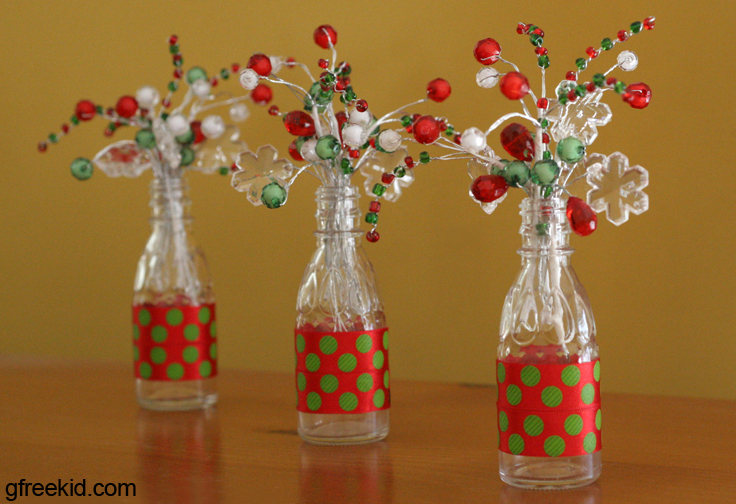 Think outside of the box: fill the large vase w/ buttons for someone into sewing, seashells for the beach lover, real holly leaves and berries, ribbons, sparkly decorations, or whatever you think the recipient would enjoy…then buy ribbon and tags that fit the styles you choose. The pots were (again) from Michaels: $.49 — $.99 each. Not sure of the sizes, but just go there and see how three of them stack up. 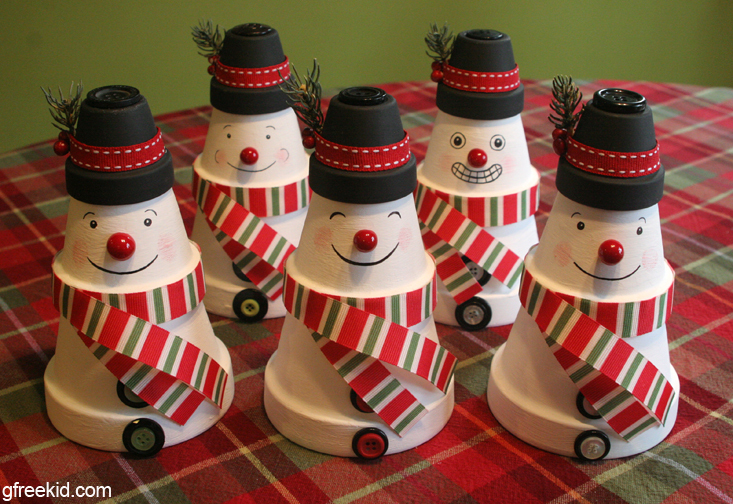 Just paint the pots with acrylic paint, glue them together and decorate as desired. The faces were just drawn with fine point Sharpies, but you could also just glue on buttons or paint on a simple face. 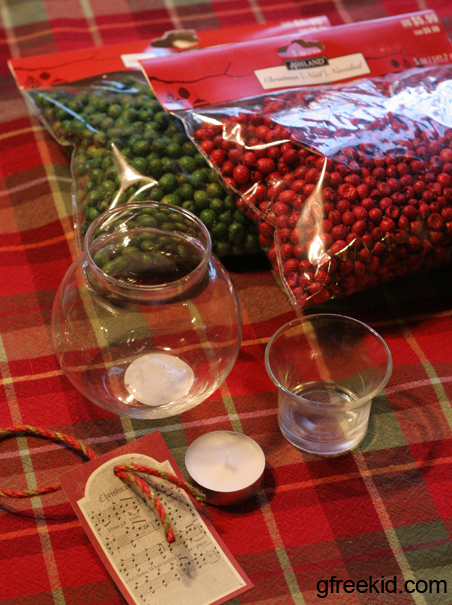 I bought a spray of fake berries and holly leaves, and cut the red berries in half with an exacto for the noses. I bought a few spools of ribbon at Michaels ($.99 a roll) that fit the neck of the middle pot where I glued it on for the scarf. Otherwise it’s just buttons glued on and decorations added to the hats. Anything goes. I bought a 3-pack of Dial Basics Hypoallergenic soap (I like a mild clean scent) at Dollar Tree for $1. Then I just glued on (school glue) pieces of scrapbook paper that I had trimmed to size with an exacto, then hot-glued ribbon and wooden shapes (a few dollars a bag from Michaels) onto which I had painted the letters JOY. If you like scented soaps, go for it. If you want to add some kind of base for the soaps to set on, have at it! Do you have any cheap and easy gift ideas to share? If so, feel free to add a link below. We can all use some go-to ideas — the more the merrier! If you try any of the above ideas, feel free to post a picture of your final project on g-free kid’s Facebook page. And feel free to pin away if you find any of these ideas worthy. This entry was posted in Uncategorized by kachalmers2. Bookmark the permalink. Love your ideas ! I especially like that you give details on where to find all the supplies as well as alternative suggestions. Fabulousness! I am in awe of you, Katie! These are awesome!